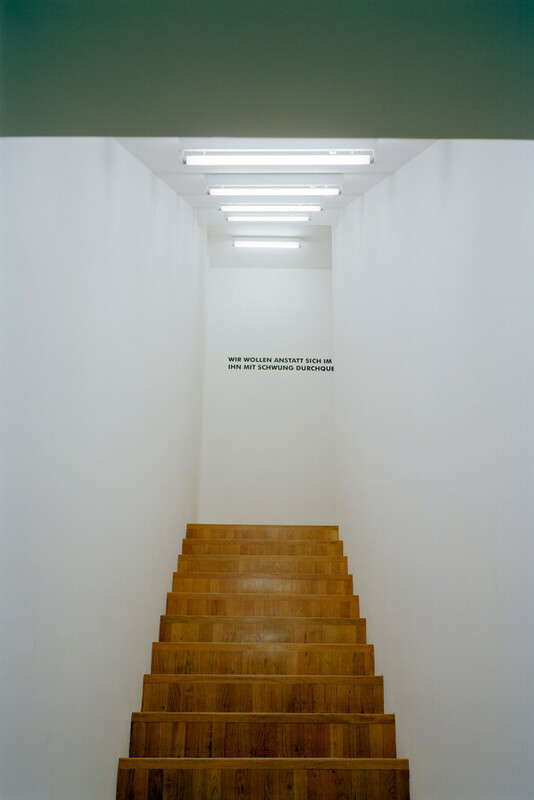 When Hannes Zebedin transforms the staircase leading up to the Graphic Cabinet into a minimalist space bathed in gleaming white light, he is citing the idea of the white cube, the ideal of a modern exhibition space. Visitors must not step on to the staircase: With all functional details artistically effaced, it no longer fulfils the statutory requirements. 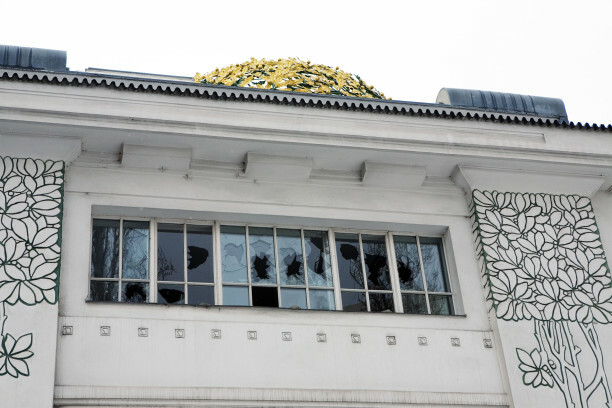 In so doing, Zebedin not only underscores the sculptural nature of the installation, but also introduces another layer of discourse: the question of regulation, restriction and power relations in civil society. 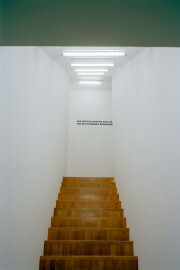 Zebedin takes a quotation of the Italian futurist Aldo Palazzeschi as a guiding principle and title for his exhibition: “Instead of dwelling in the darkness of pain, we want to cross it boldly so as to enter the light of laughter”, written—at least fragmentarily—on the wall of the staircase. 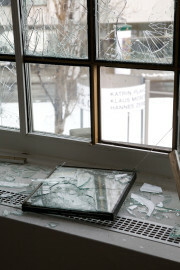 The equally inaccessible exhibition room of the Graphic Cabinet presents the scenario of a (supposed) act of vandalism. Here Hannes Zebedin examines the aesthetic potential of a political-activist act. 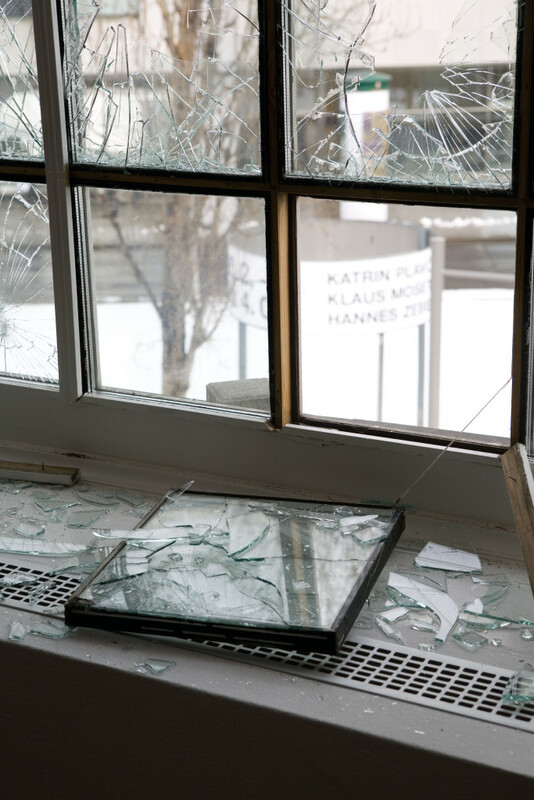 With the windows smashed, the exhibition room resembles a devastated place: pieces of broken glass and cobblestones lie scattered across the floor, the lights are off, the weather and street noise penetrate the room unfiltered and can still be heard at the entrance to the stairs. However, the devastation can only be imagined or viewed in the catalogue. 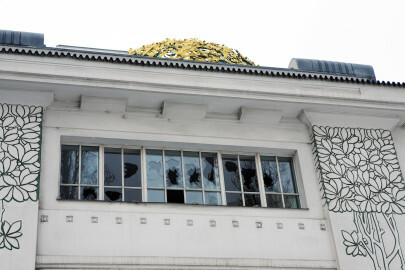 All you can see from the street side is the broken window panes. The transformation of the two spaces is directly opposed. The construction of an “ideal” situation on the one hand contrasts with the destruction of an ideal situation on the other. What does the social consensus define as within and without the accepted norm? What is regarded as a transgression of this norm? 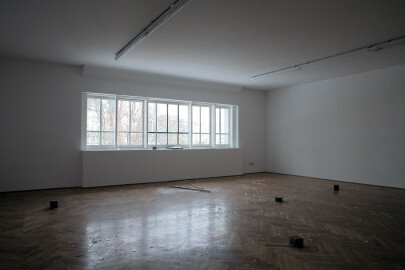 A characteristic trait of Hannes Zebedin’s artistic position is the search for possibilities of a clear political or artistic attitude that forms a contrast to the post-modern stance of “anything goes”. In this new intervention, once again he explores the possibilities of individual articulation in the face of other forces in civil society. 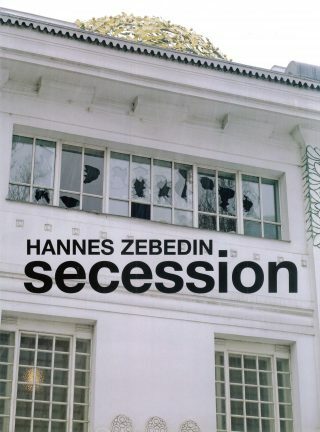 Hannes Zebedin, born in Lienz in 1976, lives and works in Vienna.